This year we are commemorating 25th anniversary of diplomatic relations between Pakistan and Azerbaijan. What are the salient aspects of our relations? Azerbaijan and Pakistan are two very close brotherly countries whose relations have been progressing without an iota of misunderstanding because the relations are based on strong roots and historical ties. In the past both nations have supported each other, have endeavoured to be part of each other’s important issues and with the blessings of Allah our efforts are now more intensified for greater improvement. Although in previous years some hostile forces had tried to cause damage to our relationship, these efforts thankfully were not successful. The salient features of Pakistan-Azerbaijan relations are based on confidence, mutual trust and respect for each other’s interests as a result the relations have been unaffected. We have shared our grief together and celebrated our successes together, consequently, the relations have stood the test of time and have markedly deepened over all these years. This has also been possible owing to the efforts and positive views of the leaders of both countries. We are now keen to enhance the canvas of our relations by strengthening people to people contact and broaden the scope of our economic and cultural relations. What is the main goal of Islamic Solidarity Year announced by your country? Having played the role of one of the Islamic world’s centre of culture and religion combined with its traditions and modernity, Azerbaijan has been able to contribute greatly in creating an atmosphere of tolerance and multiculturalism, as well as promotion of the Islamic culture in the world. Azerbaijan hosted the First European Games two years ago, while at the same time we hosted the 4th Islamic Solidarity Games this year. With these efforts we are striving to become the center of dialogue of civilizations and religions, and an economic and cultural bridge. Historically, Islam has always encouraged peace, tolerance, humane ideals and made outstanding contributions in the world. The major goal of declaration of “The Year of Islamic Solidarity” is to strive for a strong and robust unity in the Muslim world and showcase to the world that Islam is a religion of peace. Please share some details about Heydar Aliyev Foundation and its humanitarian work in Pakistan. Heydar Aliyev Foundation was established on the people’s wish in memory of Heydar Aliyev, a national leader of Azerbaijan who is held in very high esteem. Starting its activity in 2004, Heydar Aliyev Foundation had actively participated in building a new society and contributed to the social and economic development, by implementing various projects in wide ranging spheres such as education, public health, social, culture, sports, science and technology and environment. In 2005, Heydar Aliyev Foundation commenced its work in Pakistan soon after the devastating earthquake. The First Lady of Azerbaijan who is also the President of Heydar Aliyev Foundation, took the initiative to construct a school for girls in place of the destroyed one in Muzaffarabad. Since then, the Foundation regularly assists and provides the school all its needs in imparting quality education. In addition, the President, Heydar Aliyev Foundation, also initiated a series of healthcare, education, development and humanitarian projects in all provinces of Pakistan. Within the framework of the action plan, hepatitis vaccinations, checkups and treatment were carried out in various orphanages, women and children hospitals, and institutes of Pakistan. The Foundation also donated a fully equipped ambulance and thousands of blood collection bags, and gave financial assistance for construction of a new block and waiting rooms for some hospitals. During the holy month of Ramadan, the Foundation has hosted Iftar dinners to the beneficiaries of Pakistan Sweet Homes and other orphanages in the country. During Eid ul Adha, the Foundation has distributed meat of hundreds of animals to the Sweet Homes and orphanages. In 2014, the Foundation inaugurated Heydar Aliyev Water Supply Scheme in Tank, Dera Ismail Khan. This facility provided thousands of inhabitants of that area access to pure drinking water. Obviously, these social services of Azerbaijan’s First Lady in Pakistan have served to further strengthening and deepening brotherly relations between the two countries. We must also profoundly express our gratitude to the Pakistani Government and its people for acknowledging the activities of Mrs. Mehriban Aliyeva by conferring a number of awards to her like the Hilal-e-Pakistan order, as well as the title of “Symbol of Humanity, “Woman of 2012” by “Women Volunteers Organization” and “Shaheed Benazir Bhutto Excellence Award” in 2013. Please give a brief background of Nagorno Karabakh issue and Pakistan’s role in this issue? Likewise, what is country’s stand on the Kashmir issue? Nagorno Karabakh is a painful issue for Azerbaijan that was resulted owing to the Armenian separatism and terrorism since the end of the 20th century. During 1989-1994, Armenia launched military aggression against Azerbaijan, after which 20% of our land was occupied. Owing to these acts of occupation and the policy of ethnic cleansing, more than one million Azerbaijanis became refugees and IDPs in their own land. The historically native lands of Nagorno-Karabakh and seven adjacent districts were occupied by Armenia during which innocent people were killed. More heinous war crime was committed against our people – in what is commonly known as the Khojaly genocide. The Armenians have destroyed our historical and religious monuments, mosques in the occupied lands. All international organizations have unequivocally supported our stand, particularly the United Nations General Assembly which has repeatedly adopted resolutions. The UN Security Council has also adopted four resolutions demanding an unconditional and immediate withdrawal of Armenian forces. Similarly, other international organizations have also adopted resolutions like Organization of Islamic Cooperation, Parliamentary Assembly of the Council of Europe, European Parliament, Non-Aligned Movement, OSCE all have wholly supported Azerbaijan’s just position. Historically, Nagorno-Karabakh is an integral part of our country from the point of view of international law. Unfortunately, Armenia ignores these resolutions and there is no worthwhile mechanism for their implementation. Consequently, the sufferings and injustice to the innocent people from the Armenian policy go unabated. At my personal level, I wish to express my gratitude to Pakistan for always supporting Azerbaijan on this issue owing to which Pakistan has not recognized Armenia as an independent state nor established diplomatic relations with it. Our government and people highly value this brotherly approach. Moreover, Foreign Relations Committees of National Assembly and Senate of Pakistan officially recognized the Khojaly Genocide perpetrated by Armenians. This is another indication of our friendship and brotherhood. In response to your question about Kashmir issue, I would like to remind that we are a member of OIC Contact Group on Kashmir issue and always try our utmost for resolution of this long outstanding issue and wholly support the ongoing efforts to this end. We consider the peaceful resolution of Kashmir issue as a perquisite for durable peace and security in South Asia. Azerbaijan fully supports resolution of Kashmir issue based on the United Nations Security Council resolutions. As I have already said we also have resolutions on Nagorno-Karabakh issue and we would certainly advocate that all these resolutions must be implemented for peace in the region. Can OIC play a positive role on Nagorno-Karabakh issue? The Organization of Islamic Cooperation (OIC) is the first organization to acknowledge the aggression by Armenia against Azerbaijan. We greatly appreciate this role of OIC which has always strongly condemned the Armenian offensive, occupation of our territories, and demanded immediate withdrawal of Armenian forces from all our occupied territories strongly urging Armenia to respect the sovereignty and territorial integrity of Azerbaijan. OIC has always denounced the destruction of the cultural heritage and sacred Islamic sites, the forced demographic changes, interference to property rights and illegal economic activities in Nagorno-Karabakh and other occupied territories, and urges its member states to prevent their people to desist from getting involved in these illegal activities. The Organization’s summits has always kept the issue of Nagorno-Karabakh in focus and adopted clear statements, resolutions requiring observance of the norms of international law. The OIC is indeed playing an important and pro active role in this issue. What do you consider can be an amicable solution to this issue? The amicable solution to this issue is implementation of four UN Security Council resolutions and of other international organizations, which demand unconditional and immediate withdrawal of Armenian forces from our occupied lands. In preferred cases the UN Security Council resolutions, as we have seen in recent history, are executed in a matter of days. On the contrary, when it comes to Azerbaijan, more than 23 years have elapsed when these resolutions were adopted, but there has been virtually no progress. Only concerted efforts by the organizations that adopted the resolutions to forcefully insist their execution will bring an amicable solution to the issue. Azerbaijan is making progress in all fields, especially its economy. What steps has your government taken to improve its economy? During the years of independence one of the main aims of the government has been the creation of a liberal, powerful, competitive, and modern economic system. Through concerted and sincere efforts of our leaders we have by and large achieved the main strategic objectives set forth for our economy. Determination of priority objectives in the economy, their subsequent development, attraction of investment, leading to implementation of targeted state programs have all been thankfully attained. Solution of the problem of unemployment and poverty, and continuous improvement of people’s living standards are some of achievements that are visible in our country. By channeling a portion of our revenues from the production and sale of oil and gas into the development of the non-oil sector, we have revitalized our traditional sectors of economy and also developed other spheres such as tourism, space industry, information and communication technology, defense industry, and others. Azerbaijan, as is the case with other oil-rich countries, has suffered the repercussions of the falling oil prices. A scrutiny of the steps taken by all oil-exporting countries to meet this crisis, will reveal that Azerbaijan is among the countries that have successfully overcome it. According to last year’s statistics, the share of the non-oil sector in the GDP has continually increased to a remarkable benchmark of 65% which is evidence of our economic diversification and reduction in dependence on oil. The world’s leading economic and financial institutions have also acknowledged Azerbaijan’s achievements. Both Pakistan and Azerbaijan are rich in cultural heritage and impetus to further cementing ties between the countries can be achieved by improving our cultural relations? Undoubtedly, cultural relations play one of the most important role in fostering relations between nations and bring them closer. We have common faith, cultural affinity and other spiritual values. It is important to promote cultural cooperation through a wider exposure to each other’s cultural heritage and achievements through exhibitions, cultural and performance of art. Strengthening contacts and links of friendship amongst citizens, in particular the young people, and forming their associations in the fields of culture, higher education, health, youth and sports will also play a vital role in our relations. Both countries have cooperation in energy sector and defence. Can you share some details? Yes, we have a productive cooperation in defence sector which is a significant part of our relations. Pakistan has a developed defence industry and we are currently engaged in discussions for joint ventures in defence production and purchase of defence equipment. This year we are also engaged cooperation in the energy sector. During the visit of President of Azerbaijan to Pakistan in March 2017, agreement between Azerbaijan and Pakistan for cooperation in the energy sector was signed. This agreement aims to develop cooperation for supply and trade of crude oil, oil products, liquefied natural and petroleum gas, and attract investment in the energy sector. How do you see Pakistan’s role in war on terror? In recent years, Pakistan is rapidly moving towards economic and political stability and also progressing well on war against terrorism and extremism. Pakistan’s role in bringing regional stability is important. We see that the government is wholly committed to rooting out terrorism and Pakistan has always backed stability and peace in the region. Personally I greatly appreciate the sacrifices made by the Pakistan Army and Pakistani nation in their efforts to root out terrorism and extremism and the success achieved so far. Is there anything more that you wish to add? It is a great honour for me to be Ambassador of Azerbaijan in the brotherly country of Pakistan and want to put in all efforts for strengthening the relations between the two countries. It gives me immense pleasure to witness the hospitality, kindness, sincerity and simplicity of Pakistani nation. 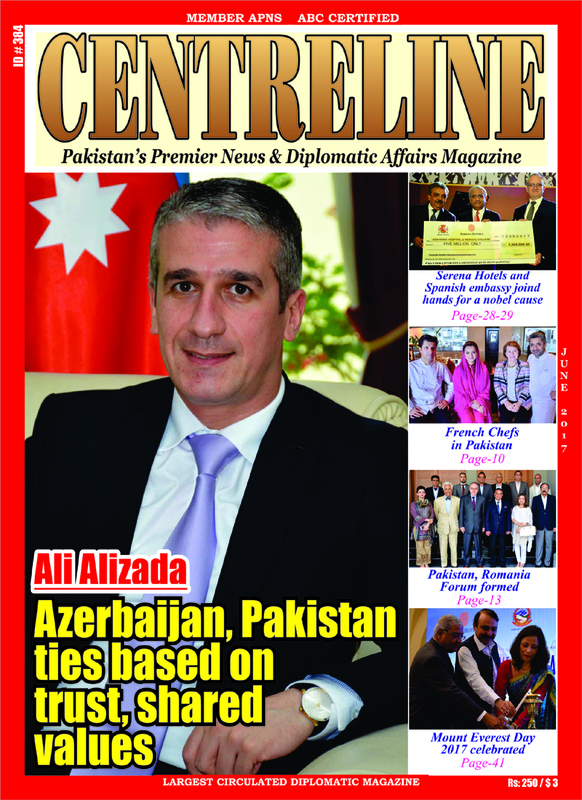 This year we are celebrating 25th anniversary of establishment of Azerbaijan-Pakistan diplomatic relations. Owing to the efforts of our leaders’ and people over these years, we achieved good results and have reached at a strategic partnership level. I am confident that our close cooperation and brotherly ties will see greater progress in the years ahead.